Nike has unveiled its long-awaited sneaker with self-tying "adaptive" laces which has been explained to be especially great for hiking and outdoor activities. It's called the HyperAdapt 1.0. Nike CEO Mark Parker introduced it at the Nike Innovation 2016 event. 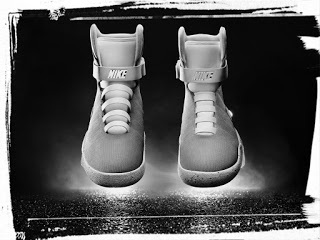 The technology has been in the works since 2013, and it's based on what went into the Nike MAG -- a replica of Marty McFly's self-lacing sneakers in "Back to the Future" that Nike made last year. How does a sneaker tie itself? "When you step in, your heel will hit a sensor and the system will automatically tighten. Then there are two buttons on the side to tighten and loosen. You can adjust it until it's perfect." That was how Nike senior innovator Tiffany Beers explained it. Nike said the HyperAdapt makes use of a "more technical, sport version" of the automatic tying mechanism. The HyperAdapt 1.0 will be available in three colors to Nike+ members this holiday season. The company said interested buyers can create an account online and sign up for updates about the shoe. The Nike+ app will be revamped in June and will give users access to "coveted products and events," the company said. Shoe designer Tinker Hatfield said the HyperAdapt shoe aims to give athletes the ability to quickly make small adjustments to how tight or loose their shoes fit. "That's an important step because feet undergo an incredible amount of stress during competition," he said in a statement. Nike did not have pricing information available about the HyperAdapt 1.0. But the new invention would be received warmly as it would reduce the stress of having to tie up a shoe lace even when in a haste.